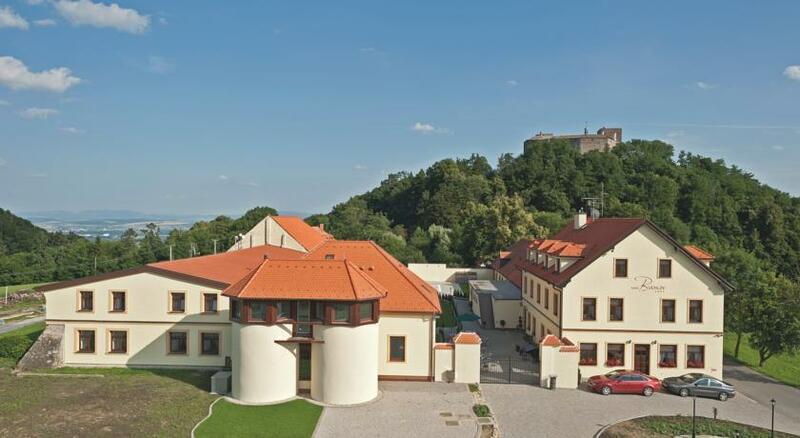 In the area of Chřiby in the Zlín region, Hotel Buchlov is peacefully situated at the foot of the Buchlov Castle, and features an outside pool and deckchairs, a restaurant serving breakfast and Czech cuisine, and free Wi-Fi. With views of the surrounding nature, all units come decorated in rustic style and have a flat-screen TV. Each comprises a private bathroom, provided with a shower. The apartments include a functionally equipped kitchenette. There is a wellness area with sauna and hot tub facilities and massage treatments on site, all available at an additional cost. Guests can also enjoy hiking and cycling on the marked wine trails in the area. Tha Buchlov Hotel is 200 metres from the Buchlov Castle and 5 km from the Buchlov Chateau. The village of Buchlovice is 7 km away. The Hradiště — Brno Highway is reachable in 3 km. Private parking is on site for free.